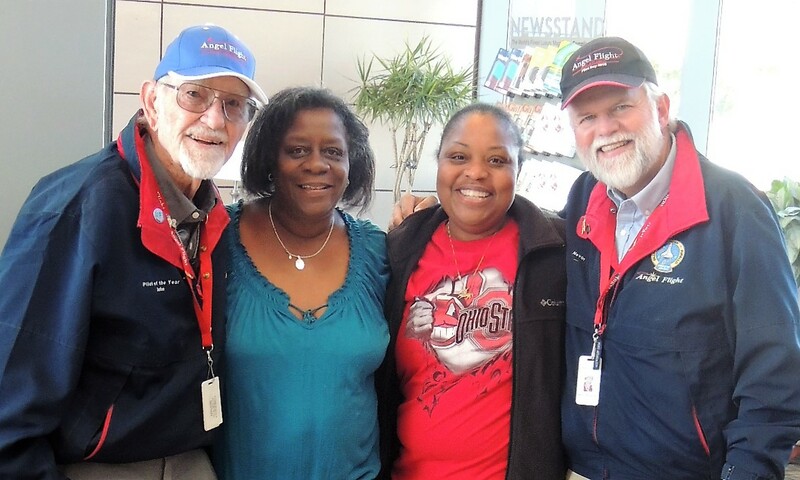 We had a great flight today down to Raleigh-Durham International, where we picked up our Angel Flight passenger, Consuela, and her mom, Diane. Our flight conditions heading down to NC at 8000 feet were very good and the winds were on our tail, helping us along very nicely. Consuela and her mom, Diane, were waiting for us with big smiles and hugs, all ready to go! After our greetings, we loaded up and were on our way to Baltimore Maryland. Our flight conditions up to BWI at 9000 feet were again, very good, and the views along this route are always fantastic! (as long as we are not in the clouds). We landed on runway 33R and soon were inside Signature Flight Support where Consuela and her mom arranged for their ground transportation and John and I put in an order for fuel. After taking a group photo, we gave our goodbyes and told Consuela and Daine that we would see them tomorrow (we will be taking them back home). Following are photos of our flight…. Have a “Great Day” all! Look!….. you can see the VA-NC border! Captain John walking into TAC AIR at Raleigh Durham International …… it was closed for renovation! Our Angel Flight Passenger Consuela (on the left) and her mom, Diane. Ready for our flight to Baltimore MD. I like that “Line”, separating the 2 states. Finally, a milk run. Great job, gentlemen. Thanks Ralph! ……. yea, that state boundary really showed out! Thank you Esther! …….. we will be flying little Miss Madison back home Monday (Oct 22nd) I will post a full report! This is soooo beautiful! Thank you so much for helping my mother and my grandmother! I know couldn’t have happened if it wasn’t for the kind hearted spirits you wonderful pilots hold! It was certainly our pleasure flying these two sweet ladies!!!!! Loved seeing that close bond! Thank you gentlemen for taking such good care of two wonderful women and great mothers! It was our pleasure Mike! The pictures of Solomon’s Island and Point Lookout bring back fond memories. We use to go to there every summer to visit friends. I was always fascinated with Solomon’s Island. Needless to say, it has grown! My wife, Sharon, and I have been there once and loved it!. We would like to take Miss Mikayla there someday soon.